Sometimes you see something online that looks ridiculously cool, but you’re not quite sure how the product will actually translate in the real world. 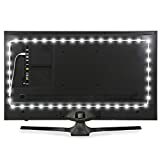 Well, let us assure you right now that the Luminoodle LED TV Backlight Kit that’s currently on sale on Amazon for just $17 isn’t just as cool as it looks online, it’s way cooler. Simply plug this nifty lighting strip into a USB port on the back of your flat-panel HDTV or UHD TV and you’ll instantly have 118 inches of true-white backlighting that illuminates as you watch. Seriously, you have to experience it to fully grasp just how awesome it is. INCLUDES: 118-in, high quality true-white (6000 Kelvin) LED strip light kit to provide 375 lumens of USB bias lighting, 3M adhesive backing and reversible USB for easy plug-in. EASY TO USE: Just clean the back of your TV, secure your LED strip light, plug the TV backlight USB plug into the USB port, and you have a great TV light or monitor backlight. Cut the LED strip every 2 inches for the perfect fit. The TV light strip powers on and off with your TV’s USB port. CREATE A BEAUTIFUL VIEWING EXPERIENCE: With LED bias lighting, you create sharper images and color contrast while adding beautiful TV ambient lighting to your surroundings. The Luminoodle Backlight for TV creates an environment that makes your friends and family want you to be the one to host viewing parties.